Systems and methods for controlling the operating speed and the torque of an electric motor using an operational model are described. An operational model for the electric motor, including a plot of engine performance parameters, is used for reference, and a most efficient output path, which may pass through an optimal operation region in the operational model, is selected. The most efficient output path may be determined, for example, according to locations of a current output state and a to-be-reached target state in the operational model, enabling the operating state of the motor to reach the target state from the current operating state. By selecting a more efficient output path, the operating efficiency of the motor may be optimized, the life of a battery improved and/or the operating mileage of the vehicle may be increased, without significantly reducing the driving experience. 本申请要求于2015年3月16日提交的申请号为62/133,991的美国临时专利申请和2015年4月22日提交的申请号为62/150,848的美国临时专利申请的优先权，其全部内容通过引用并入本文以用于满足本申请的所有目的、用途或要求。  This application claims the benefit of No. 16 March 2015 filed U.S. Provisional Patent Application 62 / 133,991 and Application No. 22 April 2015, filed priority to U.S. Provisional Patent No. 62 / 150,848 application, and incorporated in its entirety for all purposes, uses, or to meet the requirements of the present application herein by reference. 本发明涉及与电动马达(如在电动车中马达)一起使用的控制技术，且在一些示例中，涉及电动车辆的用于在运行模型中控制电动马达的运行速度和扭力的方法。  The present invention relates to a control technique for use with an electric motor (e.g. an electric motor vehicle), and in some examples, a method for controlling speed and torque of the electric motor during operation model relates to an electric vehicle. 新型环保、节能的电动车辆涉及技术发展的新兴领域，其中许多均需要进一步的改善以继续扩大这种车辆的市场前景。  new environmentally friendly, energy-efficient electric vehicle involved in the emerging field of technological development, many of which require further improvement in order to continue to expand the market prospects of such a vehicle. 人们特别关注的一个领域涉及电动车辆的电池的有限能量存储。 One area of ​​particular concern relates to the limited battery electric vehicle energy storage. 因此，减少能量损耗（以增加车辆的里程数)是尤为重要的，且用于电动马达的节能技术则是这种发展的一个关键因素。 Therefore, it is particularly important to reduce the energy loss (to increase the mileage of the vehicle), and energy-saving technologies for electric motors is a key factor in this development. 目前，电动车辆可被配置成采用ECO模式(或跛行模式）以降低动力输出和动力消耗，从而延长车辆的里程数。  At present, the electric vehicle may be configured to employ the ECO mode (or limp mode) to reduce power output and power consumption, thereby extending the mileage of the vehicle. 然而，以这种方法来延长里程数是以，例如，降低动力输出以减速和降低车辆的电气组件的动力消耗为代价的，且不利地限制或不能满足车辆的驾驶需求。 However, in this method to extend the mileage is, for example, reducing the power output to decelerate and reduce the power consumption of the electrical components of the cost of the vehicle, and adversely limit or can not meet the demand for driving the vehicle. 本发明的示例性实施例可解决上述问题中的至少一些问题。  Exemplary embodiments of the present invention at least some of the problems solved the above problems. 例如，根据本发明的第一方面，提供了一种用于在运行模型中控制电动马达的运行速度和扭力的方法。 For example, according to a first aspect of the present invention, there is provided a method of controlling operation of the electric motor in the model for speed and torque. 在实施例中，运行模型可包括电动马达的多个运行位置和优化运行区域。 In an embodiment, the model may comprise running a plurality of operating positions and optimize the operation area of ​​the electric motor. 在实施例中，每个运行位置可对应于电动马达的一个速度参数、一个扭力参数和一个运行效率参数。 In an embodiment, each operating position may correspond to a speed parameter of the electric motor, and a torque parameter a parameter operating efficiency. 实施例可包括以下步骤中的一个或多个:将运行模型存储在存储装置中；检测对应于电动马达在运行模型中的当前运行位置的当前速度参数和当前扭力参数;输入对应于电动马达在运行模型中的目标运行位置的目标速度参数和目标扭力参数;根据电动马达的当前速度参数和当前扭力参数确定当前运行位置是否位于优化运行区域内；如果当前运行位置不是位于优化运行区域内，沿着第一路径调节当前速度参数和/或当前扭力参数以将当前运行位置移动到中间运行位置，所述中间运行位置对应于中间速度参数和中间扭力参数，并且位于优化运行区域内；以及调节中间速度参数和中间扭力参数以沿第二路径将中间运行位置移动到目标运行位置。 Example embodiments may include one or more of the steps of: running the model stored in the storage device; detecting parameters corresponding to the current speed of the electric motor in the current operation model operating position and the current torque parameter; in that the electric motor corresponding to the input target speed parameter and the target torque parameters of the operating position of running the model in the target; determining a current operating position is located within the optimized operating range of the current speed parameter of the electric motor and the current torque parameter; if the current run position is not located in the optimization operation region inside, along a first current path regulating the speed parameter and / or a current torque current operating parameters to the intermediate position to the operative position, the intermediate operating position corresponding to the intermediate speed and intermediate torque parameters parameters, and positioned to optimize the operation area; and adjusting an intermediate speed parameters and the intermediate torsion parameters to run along a second path to the intermediate position to the target operating position. 根据本发明的另一些方面，用于在运行模型中控制电动马达的运行速度和扭力的其他方法可包括下列步骤中的一个或多个:将运行模型存储在存储装置中；检测对应于电动马达在运行模型中的当前运行位置的当前速度参数和当前扭力参数;输入对应于电动马达在运行模型中的目标运行位置的目标速度参数和目标扭力参数;根据电动马达的当前速度参数和当前扭力参数确定当前运行位置是否位于优化运行区域内；如果当前运行位置不是位于优化运行区域内，确定是在优化运行区域中选择中间运行位置还是直接将当前运行位置移动到目标运行位置而无需在优化运行区域中选择中间运行位置;如果需要在优化运行区域中选择中间运行位置，则沿着第一路径调节当前速度参数和/或当前扭力参数中的至少一个以将当前运行位置移动到中间运行位置，所述中间  According to other aspects of the invention, for controlling the operation of the electric motor in the model speed and torque Other methods may include one or more of the following steps: a storage device in the model storage operation; corresponding to detection the electric motor current current speed parameter operating position and the current torque parameter during operation model; input corresponds to the electric motor target speed parameter and the target torque parameters of a target operating position of the operating model; current speed parameters of the electric motor and the current torque parameter determining a current operating position is located to optimize the operation area; if the current run position is not located in the optimization operation region inside, is determined by selecting an intermediate operating position optimization operation region or directly move the current operating position to the target operating position without the need intermediate region of operation selected to optimize operating position; if necessary the intermediate operating position select optimal operation region, the current speed adjustment along the first path parameter and / or a current torque of at least one parameter to move the current position to the intermediate running operation position, the intermediate 行位置对应于中间速度参数和中间扭力参数，并且位于优化运行区域内；以及调节中间速度参数和中间扭力参数以沿第二路径将中间运行位置移动到目标运行位置。 Row position corresponding to intermediate speed and intermediate torque parameters parameters, and positioned to optimize the operation area; intermediate speed and adjusting parameters and intermediate torsion intermediate operating parameters to move the operating position to the target position along the second path. 根据本发明的另一些方面，可通过本文所描述的系统和方法采用和实施运行模型，在需要的时候，所述运行模式根据马达的当前输出状态和要实现的目标状态提供了经过运行模型中的优化运行区域的高效的输出路径，使马达的运行状态高效地从当前运行状态到达目标状态。  According to other aspects of the invention, may be employed, and running the model implemented by the systems and methods described herein, when needed, the operation mode according to the current provided via the output state of the motor and the target state to be achieved efficient operation of output path area in optimal operation of the operating state of the motor efficiently reach the target state from the current operating state. 在一些实例中，这种控制系统可提供益处，例如在不显著降低驾驶体验的前提下，优化马达的运行效率、改善驱动电池的寿命和/或可增加运行里程数。 In some examples, such a control system may provide benefits, for example, without significantly reducing the premise of driving experience, to maximize the efficiency of the motor, the drive to improve battery life and / or increase the miles run. 本发明还包括了根据所公开的方法进行配置的包括发动机控制器的车辆。 The present invention further includes a vehicle includes an engine controller configured in accordance with the disclosed methods. 通过考虑下面的详细描述、附图和权利要求，可阐明本发明的额外特性、优点和实施例或使其为显而易见的。  consideration of the following detailed description, the accompanying drawings and the appended claims, the present invention may be set forth additional features, advantages and embodiments of it or apparent. 此外，要理解的是本发明的前述概要和之后的详细描述均为示例性的且旨在提供进一步的解释而不限制本发明所要求保护的范围。 Further, it is understood that the foregoing summary of the invention and the following detailed description are exemplary and are intended to provide further explanation without limiting the scope of the claimed invention. 然而，详细描述和特定实例仅指示了本发明的优选实施例。 However, only the detailed description and specific examples indicating preferred embodiments of the present invention. 根据该详细描述，对于本领域的技术人员来说，在本发明的精神和范围内的各种变化和修改将变得显而易见。 This detailed description, those skilled in the art that various changes and modifications within the spirit and scope of the invention will become apparent. 图1为根据本发明各方面的示例性电动车辆马达效率控制系统的模块图。  FIG. 1 is a block diagram of an exemplary motor efficiency of the electric vehicle control system according to aspects of the present invention. 图2为根据本发明各方面的马达效率控制流程图。  FIG. 2 is a motor efficiency according to aspects of the present invention a control flowchart. 图3A为根据本发明各方面的在运行模型中的马达运行状态的第一个示例。  FIG 3A is a first example of the operation of the motor in the operation state model with aspects of the present invention. 图3B为根据本发明各方面的在运行模型中的马达运行状态的第二个示例。  FIG. 3B is a second example of the operating state of the motor running in a model of the aspects of the present invention. 图3C为根据本发明各方面的在运行模型中的马达运行状态的第三个示例。  FIG 3C is a third example of the operating state of the motor running in a model of the aspects of the present invention. 图3D为根据本发明各方面的在运行模型中的马达运行状态的第四个示例。  FIG 3D is a fourth example of the operating state of the motor running in a model of the aspects of the present invention. 图4为根据本发明各方面的运行模型的修正或更新流程图。  FIG 4 is a flowchart of a correction operation models aspects of the present invention or update. 图5A为根据本发明的一个实施例的运行模型修正图。  FIG 5A is a model correction operation according to an embodiment of the present invention. 图5B为根据本发明的另一个实施例的运行模型修正图。  FIG 5B is a model correction operation according to another embodiment of FIG invention. 下面将参考构成本说明书的一部分的附图描述本发明的各种实例实施例。  Next, with reference to the accompanying drawings which form a part of this specification to describe various example embodiments of the present invention. 应该理解的是，虽然在本发明中使用表示方向的术语，诸如"前"、"后"、"上"、"下"、"左"、"右"等描述本发明的各种示例结构部分和元件，但是在此使用这些术语只是为了方便说明的目的， 基于附图中显示的示例方位而确定的。 It should be understood that, although the terms used in the present invention indicates a direction, such as "front", "rear", "upper", "lower", "left", "right" to describe various examples of the present invention moieties and elements, but these terms are used herein only for purposes of convenience of illustration, the example shown in the figures based on the orientation determined. 由于本发明所公开的实施例可以按照不同的方向设置，所以这些表示方向的术语只是作为说明而不应视作为限制。 Since the embodiment of the present invention disclosed embodiments can be provided in different directions, so that these terms indicate the direction of illustration only and should not be regarded as limiting. 在任何可能的情况下，本发明中使用的相同或者相类似的附图标记指的是相同的部件。 Any possible, the same as used in the present invention or similar reference numerals refer to like parts. 除非另有定义外，本文使用的所有技术术语均具有与本发明所属领域的普通技术人员通常所理解含义相同的含义。  Unless otherwise defined, all technical terms used herein have the field of the invention one of ordinary skill in the same meaning as commonly understood. 本发明的实施例及其中的各种特性和有利的细节是参考在附图中所述和/或所示的以及在以下描述中详细描述的非限制性实施例和实例而更充分地进行解释的。 Characteristics of the various embodiments and advantageous embodiments and details of the invention are more fully by reference in the accompanying drawings be interpreted / or and non-limiting embodiments and examples described in detail in the following description and shown in of. 应当注意的是，即使在这里没有明确说明，如技术人员将认识到的，在附图中示出的特征不一定按比例绘制，且一个实施例的特征也可由其他实施例所采用。 It should be noted that, even where not explicitly stated, such as the art will recognize, the features illustrated in the drawings are not necessarily drawn to scale, and the features of one embodiment may also be employed in other embodiments embodiment. 可省略有关公知部件和处理技术的描述以免不必要地不利于本发明的实施例原则的理解。 Description of well-known components and processing techniques may be omitted to avoid unnecessarily embodiment not facilitate understanding the principles of the embodiment of the present invention. 本文所使用的实例仅旨在促进对可实践本发明的方式的理解，并进一步地使本领域的技术人员实践本发明的实施例。 As used herein, examples are intended to facilitate an understanding of ways to practice the present invention only, and further enable those skilled in the art to practice embodiments of the present invention. 因此，本文的实例和实施例不应被解释为限制本发明的范围，其仅仅是由所附权利要求和适用法律所限定。 Thus, examples and embodiments herein should not be construed as limiting the scope of the present invention, it is only by the appended claims and applicable law defined. 此外，应当注意的是在所有附图的几个视图中相同的附图标记指的是相同的部分。 Further, it should be noted that throughout the several views of the drawings like reference numerals refer to the same parts. 图1为根据本发明各方面的示例性电动车辆马达效率控制系统的模块框图。  FIG. 1 is a block diagram of an exemplary electric vehicle motor according to the efficiency aspects of the control system of the present invention. 如在图1中所示，用于控制电动车辆的控制系统可包括电池组110、马达驱动电路103、马达104、 传感器105、中控台106(包括CPU 109)、驾驶输入系统107、存储器108等。 As shown in FIG. 1, for controlling an electric vehicle control system may include a battery pack 110, motor drive circuit 103, motor 104, sensor 105, center console 106 (comprising CPU 109), the driving input system 107, memory 108 Wait. 电池组110提供马达104运行动力；马达驱动电路103可连接在马达104和电池组110之间，以将电池组110的电力传输给马达104,马达104的工作状态可以通过控制输送给马达104的电压/电流而被控制。 The battery pack 110 provides power to run the motor 104; a motor drive circuit 103 may be connected between the battery 110 and the motor 104, the power transmission to the battery pack 110 to the motor 104, the motor 104 of the operating state can be supplied to the motor 104 by controlling voltage / current is controlled. 传感器105可用于感测马达104的当前运行参数(例如，速度和扭力），并将运行参数发送给中控台106。 Sensor 105 may be sensed for the current operating parameters of motor 104 (e.g., speed and torque), and sends operating parameters to the console 106. 根据这些参数，中控台106可以判断马达104的当前运行状态，并发送控制信号给马达驱动电路103以改变至马达104的电压/电流输入，由此改变马达的运行状态。 Based on these parameters, the console 106 may determine the current operating state of the motor 104, and sends a control signal to the motor drive circuit 103 to alter the voltage / current input of the motor 104, thereby changing the operating state of the motor. 中控台106还可连接有驾驶输入系统107和存储器108。 Console 106 may also be connected to the input drive system 107 and a memory 108. 传动输入系统107可被配置成向中控台106输入马达104的目标运行状态，存储器108可用于存储马达运行模型，且中控台106可被配置成从存储在存储器108中的马达运行模型读取数据以及向马达运行模型写入数据。 Transmission input system 107 may be configured to input the target operating state of the motor 104 to the console 106, the memory 108 may be used to store the operation of the motor model, and the center console 106 may be configured to read from the operation of the motor model stored in memory 108 fetch and write data to the motor to run the model. 在两维或三维坐标中表示的运行模型（见图3A-图3D)可以是通过预先模拟马达104的各种运行状态而得到的马达运行效率表，且可包括马达在运行模型中的多个运行位置(运行状态）的集合。  Running the model shown in the two-dimensional or three-dimensional coordinates (see FIG. 3A- 3D) may be simulated in advance by various operating states of the motor 104 and the motor operating efficiency obtained table, and may include a run motor model a set of a plurality of operating positions (operating state). 每个运行位置可对应于马达的多个运行参数。 Each operating position may correspond to a plurality of operating parameters of the motor. 例如，第一维参数可表示马达的输出扭力（用纵坐标表示)且第二维参数可表示马达的速度(用横坐标表示）。 For example, a first dimension parameter may represent the output torque of the motor (indicated by the ordinate) and the second dimension represents the speed of the motor parameters (represented by the abscissa). 在如图3A-3D所示的运行模型中，每个运行位置还对应于马达运行效率参数，马达运行效率参数的集合可形成不同的等值区域，运行效率参数可以被认为是在第三维上所表示的参数。  In the operation of the model shown in Fig 3A-3D, each operating position also corresponds to the operating efficiency of the motor parameters, a set of motor operating efficiency parameters may form different regions equivalent, operating efficiency parameters may be considered to be the third dimension parameter represents. 马达优化运行区域可在马达运行效率表中进行定义。 Optimization of the motor can be defined in the operating region of the motor operating efficiency table. 例如，马达优化运行区域由图3A-图3D中的（最里面的）边界1所围绕的区域和边界1所构成。 For example, to optimize operating region is constituted by a motor of FIG. 3A- FIG. 3D boundary and the boundary region 11 surrounded (innermost). 马达优化运行区域集合了一部分在运行模型中的运行位置，在这些运行位置中，马达的运行效率数值相对地高。 The motor run region set to optimize the operation of part of the model operating position in which operating position, the operating efficiency of the motor is relatively high value. 本发明在需要时使马达在运行状态变化过程中经过马达优化运行区域且随后到达目标状态，以消耗最少或更少的能量。 The present invention need to go through the motor when the motor operates in the region optimized operation state change process and then reaches the target state to consume a minimum of energy or less. 参考图2进一步描述示例性控制步骤。 FIG 2 is further described with reference to exemplary control step. 图2为本发明的马达效率控制流程图。  Motor efficiency Figure 2 is a control flowchart of the present invention. 本文所描述的每个操作可表示为一系列的操作，一系列的操作这可被在硬件或在硬件中执行的计算机指令所执行。 Each operation described herein may be represented as a series of operations, a series of operations which may be performed in hardware or computer instructions executed in hardware. 在计算机指令的背景下，操作表示为存储在一个或多个计算机可读存储介质上的计算机可执行指令，当通过一个或多个物理处理器进行执行时，就能完成所述的操作。 In the context of computer instructions, computer-executable instructions for read operation on a storage medium to store one or more computer, when executed by one or more physical processors, the operation can be done. 通常，计算机可执行指令包括例程(子程序）、程序、对象(objects)、组件等，这些例程(子程序）、程序、对象(objects)、部件组件能执行某特定的功能或实现某一特定的数据类型。 Generally, a computer-executable instructions include routines (routines), programs, objects (Objects), components, etc., these routines (routines), programs, objects (Objects), a component assembly can perform a particular function or achieve a specific data type. 本文所描述的操作顺序并不旨在被解释为对本发明的限制，且所描述任何多步骤的操作可按任何顺序和/或并行地进行组合以完成操作进程。 The sequence of operations described herein are not intended to be construed as limiting the present invention, and described in any order of the operation of any multi-step and / or in parallel are combined to complete the operation process. 此外，任何对能够按不同顺序进行的一个或多个操作的具体引用(reference)不能被理解为一种建议或提示:其他操作可能无法按另一顺序执行。 In addition, any one or more of the specific operations that can be performed in different order reference (reference) can not be understood as a recommendation or prompts: other operations may not be performed in another order. 流程可开始于步骤201，在该步骤，可在，例如存储器108中预先存储马达运行效率表(运行模型）。  The process may begin at step 201, in this step, may be, for example, the memory 108 stores in advance the efficiency of the motor operation table (operation model). 流程可在步骤202继续进行，在该步骤传感器(例如，105)感测马达(例如，104)的当前运行参数，包括速度和输出扭力，并将当前运行参数发送给控制器/处理器，如中控台106。  The process may continue at step 202, at which step the sensor (e.g., 105) senses a motor (e.g., 104) of the current operating parameters, including speed and the output torque, and the current operating parameters are transmitted to the controller / processing , such as the console 106. 控制器/处理器可(例如，使用处理器(CPU)109)计算对应于当前运行参数的在马达运行效率表中的位置，从而在马达运行效率表上获得马达在运行模型中的当前运行位置。 The controller / processor may (e.g., using a processor (CPU) 109) calculate parameters corresponding to the current position of the operating table in the operating efficiency of the motor, thereby obtaining the current position of the motor running in the running model on the motor operating efficiency table . 流程可在203继续进行，在该步骤驾驶输入系统（例如，107)输入目标运行参数(速度和扭力），且控制器/处理器计算对应于目标运行参数的在马达运行效率表中的位置，从而得到马达在运行模型中的目标运行位置。  The process may continue at 203, the step driving input system (e.g., 107) input target operating parameters (speed and torque), and the controller / processor to calculate a parameter corresponding to a target operating efficiency of the motor operating table position, whereby the motor is running in the target operating position of the model. 流程可在步骤204继续进行，在该步骤控制器/处理器可确定马达104的当前运行位置是否在运行模型中马达的优化运行区域内。  The process may continue at step 204, at which step the controller / processor 104 may determine a current operating position of the motor is within the operating region of the motor optimization model runs. 若否，流程则可继续进行205;或若是，流程则可继续进行211。 If not, the process 205 may proceed; or if, the process 211 can proceed. 如果流程前进至步骤205,控制器/处理器可在马达优化运行区域中寻找一中间运行位置，并确定从当前运行位置到中间运行位置的第一路径、从中间运行位置到目标运行位置的第二路径、和/或从当前运行位置到目标运行位置的第三路径。  If the process proceeds to step 205, the controller / processor may look for an intermediate operating position of the operating region of the motor optimization, and determines a first path running from the current position to the intermediate operative position, from the intermediate position to the target running operation a second path position, and / or from the current position to the target running a third operating position of the path. 在一些示例中，中间运行位置可以是马达优化运行区域的边界上，是优化运行区域中距离马达的当前运行位置最近的位置，第一路径可以是从当前运行位置到中间运行位置的最短路径，第二路径可以是从中间运行位置到目标运行位置的最短路径，第三路径可以是从当前运行位置到目标运行位置的最短路径。 In some examples, the intermediate operating position may be a motor running region boundary optimization is to optimize the current operating position of the motor from the closest position in the operating region, a first current path may be from the operating position to the intermediate operative position of the shortest path, the second path may be from the intermediate position to the operating position of the shortest path to the target operation, a third path may be from the current position to the target operating position of running the shortest path. 流程可继续从步骤205前进至步骤206,在该步骤控制器/处理器可确定是否需要优化马达的运行状态;若是，流程可继续进行步骤207;否则，流程可前进至步骤211。  The flow may proceed from step 205 to step 206, at which step the controller / processor may determine whether to optimize the operating state of the motor; If so, the flow may proceed to step 207; otherwise, the flow may proceed to step 211. 在步骤207中，控制器/处理器可向马达驱动电路(例如，103)发送指令以调节至马达的输入电压和/或电流，从而使马达(例如，104)的运行状态沿着205中确定的第一路径从运行模型中当前运行位置到达中间运行位置。  In step 207, the controller / processor (e.g., 103) transmits an instruction to the motor drive circuit to adjust the input voltage to the motor and / or current to the motor (e.g., 104) along the operating state the first path 205 is determined from the operation model operating position to an intermediate position of the current run. 流程可从步骤207前进至步骤208,在该步骤控制器/处理器可向马达驱动电路发送指令以调节马达的输入电压/电流，从而使马达的运行状态沿着205中确定的第二路径从运行模型中的中间运行位置到达目标运行位置。  The process may proceed from step 207 to step 208, at which step the controller / processor can send instructions to motor drive circuit to adjust the motor input voltage / current, so that the operating state of the motor 205 is determined along a first two target path to run from the intermediate position in the operating position to run the model. 返回至在如上所述的步骤204或步骤206之后的步骤211，控制器/处理器可向马达驱动电路发送指令以调节马达的输入电压/电流，从而使马达的运行状态沿着205中确定的第三路径从当前运行位置到达目标运行位置。  Back to 211, the controller / processor may send instructions in step 206 after step 204 or step described above, the motor driving circuit of the motor for adjusting the input voltage / current, so that the operating state of the motor 205 along the determining a third path runs from the position reaches the target position of the current run. 在步骤211中，马达的运行状态沿着205中确定的第三路径从当前运行位置直接移向目标运行位置。 In step 211, the operating state of the motor 205 along the third path toward a target operating position is determined directly from the current operating position. 在步骤211或步骤208中使马达的运行状态到达目标运行位置后，流程可在步骤209继续进行，在该步骤(根据马达的实际运行效率），控制器/处理器可向存储器写入数据以修正或更新所存储的马达运行效率表(也可见图4中更详细步骤）。 After the  operating state of step 211 or step 208, manipulation of the motor reaches the target operating position, the flow may continue at step 209, at which step (actual operating efficiency of the motor), the controller / processor can write to the memory in the operating efficiency of the data table stored in the correction or updating of the motor (see also FIG. 4 in more detail step). 流程可在步骤210继续进行，在该步骤控制器/处理器可确定马达是否停止运行； 若是，则可结束控制操作；否则，流程则可返回至202。  The process may continue at step 210, at which step the controller / processor may determine whether the motor stops running; if it may be the end of the control operation; otherwise, the flow may return to 202. 下面将结合图3A-3D示出的在本发明的运行模型中的马达运行状态的几个示例来说明关于确定中间运行位置、第一路径、第二路径和第三路径以及判断是否需要优化马达的运行状态以提高马达的运行效率的示例性方法的进一步的细节。  below with reference to several examples shown in FIG operation state running a motor 3A-3D model of the present invention will be described on the determination of an intermediate operating position, the first path, the second path and the third path and determining whether further details of an exemplary method of operating state of the motor needs to be optimized to improve the operating efficiency of the motor. 图3A为在本发明的运行模型中的马达运行状态的第一个示例，其中，马达的当前运行位置不在优化运行区域中。  FIG 3A is a state of operation of the motor model of the present invention in operation in a first example in which the current position of the motor is not running the optimization of the operating region. 在如图3A所示的马达运行模型（马达运行效率表）中，边界1、2、3、4所包围的区域表示不同的运行效率值，而每一区域内的运行效率值相等，其中，边界1之内的区域(包括边界1)被定义为优化运行区域，即高效运行区域，其效率被记为L。  In the operation of the motor model (motor operating efficiency table) shown in Figure 3A, the area surrounded by the boundary 1,2,3,4 represent different values ​​of operating efficiency, while the efficiency value in each region is equal to , wherein the region (including a boundary) within one of the boundary area is defined as the optimized operation, i.e. efficient operating region, the efficiency of which is referred to as L. 边界1与2之间的区域(包括边界2)的效率记为ξί!，边界2与3之间的区域(包括边界3)的效率记为ξ χ，边界3与4之间的区域(包括边界4)的效率记为ξ。 Efficiency range between 1 and the second boundary (inclusive 2) is referred to as ξί !, region (including a boundary 3) between 2 and 3 referred to as the efficiency of the boundary ξ χ, region (including a boundary between 3 and 4 boundary 4) efficiency denoted ξ. ，边界4之外的区域的效率记为1。 Outside the efficiency range, referred to as a boundary 4. 效率在高效区域中具有最高的值，且效率值向外递减，即图3Α中，Α点代表马达的当前运行位置，Β 点代表中间运行位置，C点代表目标运行位置。 High efficiency in the region having the highest value, and decreasing outwardly efficiency value, i.e. FIG 3Α, the current operating point represents the position of the motor Α, Beta represent the middle point of the operating position, C represents the target operating point location. 3,在算N个点102.......On中，取与A点直线距离最短（即Di最小）的点0i为B点。  3, the operator 102 ....... On N points in a straight line from point A to take the shortest (i.e., the minimum Di) point B 0i point. 在确定充当中间运行位置的B点后，第一、第二、第三路径也随之确定。  After determining the point B serving as the intermediate operating position, the first, second, third path also will be determined. 第一路径是(在运行模型中）从当前运行位置A到中间运行位置B的直线路径，第二路径是(在运行模型中）从中间运行位置B到目标运行位置C的直线路径，第三路径是（在运行模型中）从当前运行位置A直接到目标运行位置C的直线路径。 A first path (in the running model) from the current operating position A to position B intermediate operating straight path, the second path (in the model running) to run a straight path from the intermediate position B to the target operating position C, the third path (running in the model) from the current running position a straight path directly to the target operating position C.
 在确定了中间运行位置、第一路径、第二路径和第三路径之后，即可判断如在步骤206中所述的是否需要对马达的运行状态进行优化。  After determining an intermediate operating position, the first path, the second path and the third path, is determined as to whether the operating state of the motor to be optimized in the step 206. 根据本发明的示例性方法，如果需要对马达的运行状态进行优化，则马达首先从当前运行位置A沿第一路径到达中间运行位置B， 再从中间运行位置B沿第二路径到达目标运行位置C(即马达沿路径ABC运行）。 According to an exemplary method of the present invention, if desired to optimize the operating state of the motor, the motor first reaches the intermediate position B along a first running path from the current operating position A, and then reach the target position from the intermediate operative position runs along a second path B C (i.e., the motor run along path ABC). 如果不需要对马达的运行状态进行优化，则马达直接从当前运行位置A沿第三路径到达目标运行位置C (即马达沿路径AC运行）。 If the motor does not need to optimize the operating state, the motor along the third path to the target operating position C (i.e., along the path AC motor is running) to run directly from the current position A. 确定是否需要对马达的运行状态进行优化是通过(在运行模型中） 对比马达沿路径ABC和路径AC运行所消耗的能量大小来确定的；如果沿路径ABC所消耗的能量较小，则确定需要对马达的运行状态进行优化;且如果沿路径AC所消耗的能量较小，则确定不需要对马达的运行状态进行优化。 Determining whether the running state of the motor is determined by optimizing (in the running model) of energy than the motor along the path of the ABC and AC paths run consumed; ABC along the path if the energy consumption is small, it is determined that need running state of the motor to be optimized; along the path, and if the AC energy consumption is small, it is determined that the operating state of the motor does not need to be optimized. 若EABC〈EAC，，则表示沿路径ABC所消耗的电能E ABC较低且因此较为经济，从而确定马达沿路径ABC运行，以对马达的运行状态进行优化;反之，则无须对马达的运行状态进行优化，而是使马达沿路径AC运行。  When EABC <EAC ,, indicates along path E ABC lower power consumption and therefore more economical ABC, ABC in order to determine the motor to run along the path to the operating state of the motor is optimized; on the contrary, there is no need for the motor optimize the operating state, but the AC motor to run along the path. 以上公式和比较方法是一种示意性的实施例。 Comparison of the above formulas and methods are illustrative embodiment of a. 下面将结合图3A所示的在运行模型中的马达运行状态的第一个示例对上面的判断方法进行示例性说明。  below with reference to FIG. 3A a first example of operating state of the motor during operation of the model shown in the above described exemplary method of determination. 故，EABC〈EAC，沿路径ABC运行所消耗的电能较低且因此较为经济，从而相应地判断需要对马达的运行状态进行优化，并控制马达沿路径ABC从当前运行位置到达目标运行位置。  Therefore, EABC <EAC, low running along the path ABC electricity consumed and thus more economical, thereby determining a corresponding operating state of the motor needs to be optimized, and controls the motor to reach the target run along a path from a current ABC operating position position. 图3B为在本发明的运行模型中的马达运行状态的第二个示例，其中，马达的当前运行位置不在优化运行区域中。  FIG. 3B is a running operating state of the motor model of the present invention in a second example in which the current position of the motor is not running the optimization of the operating region. 下面将结合图3B所示的示例对上面的判断方法进行示例性说明。 Below with reference to the example shown in FIG. 3B above described exemplary method of determination. 图3C为在本发明的运行模型中的马达运行状态的第三个示例，其中，马达的当前运行位置不在优化运行区域中。  FIG 3C is a running operating state of the motor model of the present invention, in the third example in which the current position of the motor is not running the optimization of the operating region. 下面将结合图3C所示的示例对上面的判断方法进行示例性说明。 Below in connection with the example of FIG. 3C above described exemplary method of determination. 故，EABC>EAC，沿路径AC运行所消耗的电能较低且因此较为经济，从而相应地判断不需要对马达的运行状态进行优化，并控制马达沿路径AC从当前运行位置到达目标运行位置。  Therefore, EABC> EAC, low running along the path AC electricity consumed and therefore more economical, to correspondingly determine the operating state of the motor does not need to optimize and control the AC motor to reach the target along a path from a current operating position operating position. 总之，路径的选择与A，B，C三点在马达运行效率表上（在运行模型中）的位置及其各自的效率有关。  In summary, the route selection and A, B, C three o'clock position (in the running model) and their respective efficiencies associated table on the motor operating efficiency. 从马达的运行原则上来说，当AB两点之间的扭力差小且AC两点之间的转速差大时，路径ABC模式较为适用。 From the operating principle of the motor, when the rotation speed between the torque difference is small between the points AB and AC two points is large, the path mode is convenient for ABC. 图3D为在本发明的运行模型中的马达运行状态的第四个示例，其中，马达的当前运行位置在优化运行区域中。  FIG 3D is a state of operation of the motor running the model in the present invention of a fourth example in which the current position of the motor operation in the optimization operation region. 根据图2所示的控制流程图，当马达的当前运行位置在优化运行区域中时，直接判断为不需要对马达的运行状态进行如图3A-3C那样的优化，并控制马达沿路径AC从当前运行位置到达目标运行位置。 A control flowchart shown in FIG. 2, when the current position of the motor running in the optimization of the operating region, the direct optimization judgment as shown in FIG 3A-3C is not needed to the operating state of the motor, and controls the AC motor along a path from current operating position to reach the target operating position. 也就是说，当马达的当前运行位置在优化运行区域中时，如果也为马达确定中间运行位置B，那么马达沿路径ABC所消耗的能量将大于马达沿路径AC所消耗的能量。 That is, when the current position of the motor running in optimizing operating region, is also determined if the intermediate operating position B of the motor, the motor along the path ABC will be greater than the energy consumed along the path AC motor energy consumed. 这可以通过以下计算得到验证。 This can be verified by the following calculation. 图4为本发明的示例性运行模型的修正(更新)流程图（示出步骤209中更详细的步骤）。 An exemplary operation of the correction model  FIG. 4 of the present invention (updated) flowchart (steps shown in more detail step 209). 本文所描述的每个操作可表示为可在硬件或在硬件中执行的计算机指令中所执行的一个序列的操作(操作序列）。 Each operation described herein may be represented as a sequence executed in hardware or computer instructions executed in hardware operation in (operation sequence). 在计算机指令的背景下，操作背表示成存储在一个或多个计算机可读存储介质上的计算机可执行指令，当通过一个或多个物理处理器进行执行这些指令时，就能完成以上所述的操作。 In the context of computer instructions, expressed as back operation is stored in one or more computer-executable instructions on a computer-readable storage medium, the instructions when executed by the one or more physical processors, the above can be done operation. 通常，计算机可执行指令包括例程(子程序）、程序、对象、 组件等，其执行某一特定的功能或实现某一特定的数据类型。 Generally, a computer-executable instructions include routines (routines), programs, objects, components, etc., that performs a particular function or achieve a particular data type. 本文所描述的操作顺序并不旨在被解释为对本发明的限制，且所描述任何多步骤的操作可按任何顺序和/或并行地进行组合以完成操作进程。 The sequence of operations described herein are not intended to be construed as limiting the present invention, and described in any order of the operation of any multi-step and / or in parallel are combined to complete the operation process. 此外，任何对能够按不同顺序进行的一个或多个操作的具体引用(reference)不能被理解为一种建议或提示:其他操作可能无法按另一顺序执行。 In addition, any one or more of the specific operations that can be performed in different order reference (reference) can not be understood as a recommendation or prompts: other operations may not be performed in another order. 在前述的运行模式控制方法中，运行模型可使用在马达和/或车辆装配之前的模拟测试数据值，且在马达的实际使用中，在马达的实际运行效率与模拟数据之间由于各种原因可能存在差异。  In the foregoing method of controlling the operating mode, may be used in a simulation model running test data value before the motor and / or a vehicle assembly and in actual use of the motor, between the actual operating efficiency of the motor due to the analog data There may be various reasons for the differences. 因此，可能有利地是，例如，根据马达的实际运行情况实时地修正（更新)所存储的运行模型。 Thus, it may be advantageous, for example, according to the actual operation of the motor is corrected (updated) stored in the model is run in real time. 例如，可按某个间隔或在每次马达运行至目标位置后对运行模型进行修正（更新）。 For example, after a certain interval or according to each operation of the motor to a target position correction operation model (updated). 图2所示的步骤209中由控制器/处理器写入存储器中以修正（更新)所存储的马达运行效率表的数据可通过如图4中所示的修正(更新)流程而获得。 Obtained in the step 209 shown in FIG. 2 is written by controller / processor corrected (updated) as shown in the flow data memory 4 in the operating efficiency of the motor to the correction table (updated) stored by FIG. 在步骤401中，控制器/处理器可根据马达在目标运行位置C的输入电压和电流计算马达的输入电能。  In step 401, the controller / processor may calculate the input power of the motor according to the motor input voltage and current in the target operating position C. 例如，马达在目标运行位置C的输入电压和电流可以由传感器从驱动电路检测得到。 For example, the motor can be obtained at the input voltage and current target operating position C detected by the sensor from the drive circuit. 流程可继续进行步骤402,其中控制器/处理器可根据传感器检测的马达在目标运行位置C的扭力和转速计算马达的输出机械能。  The flow may proceed to step 402, wherein the controller / processor may be detected by the sensor according to the motor rotation speed and the target torque calculated in the operating position C of the motor output mechanical energy. 流程可继续进行步骤403,其中控制器/处理器可计算马达在目标运行位置C的实际运行效率。  The flow may proceed to step 403, wherein the controller / processor may calculate the actual motor operating efficiency in the target operating position C.
 流程可继续进行步骤404，其中控制器/处理器可根据运行模型中的对应于目标运行位置的运行效率（即理论运行效率）以及马达在步骤403中计算的目标运行位置的实际操作效率来计算修正(更新)系数。  The flow may proceed to step 404, where the actual operation of the controller / processor operating efficiency (i.e., the theoretical operating efficiency) to the target operating position and the target operating position of the motor calculated in step 403 according to the corresponding operation model efficiency is calculated corrected (updated) coefficients. 流程可继续进行步骤405,其中控制器/处理器可确定与目标运行位置C接近的至少一个要被修正的位置C'。  The flow may proceed to step 405, wherein the controller / processor may determine the target operating position C at least close to a corrected position C '. 流程可继续进行步骤406,其中控制器/处理器可计算在目标运行位置C和要被修正的位置C'之间的距离H。  flow may proceed to step 406, wherein the controller / processor may calculate the distance between the target and the operating position C to the position of the corrected C 'H. 流程可继续进行步骤407,其中控制器/处理器可根据在步骤404中计算的修正系数和在步骤406中计算的距离Η计算修正量。  The flow may proceed to step 407, wherein the controller / processor based on the correction factor calculated in step 404 and in step 406 the calculated correction amount is calculated from Η. 流程可继续进行408,其中要在运行模型中进行修正的位置C'的位置是根据修正量进行修正(更新）的，且数据被存储至存储器中。  Process 408 may continue, wherein the position C to be corrected in the operation model 'position is corrected (updated) according to the correction amount, and the data is stored into memory. 4)将C'点修正为CC'的直线路径上距离C点αΗ的位置处。 Point C at a distance of a position αΗ  4) The point C 'is corrected to CC' of the straight path. 如此，每当马达运行到达一个目标位置时，则对运行模型进行一次修正(更新）。  Thus, whenever the operation of the motor reaches a target position, the operation of a correction model (updated). 这样，在每次修正(更新)期间，可改变在效率边界上的一个点的位置，在进行多次修正(更新） 后，马达运行模型中的效率边界线相对于横坐标和纵坐标的位置即会发生改变，且这种改变会使得马达运行模型更加（动态地)接近马达的实际运行状况。 Thus, after each correction period (update), can change the position of a point on the boundary of the efficiency, the correction is performed a plurality of times (update), the efficiency of operation of the motor model boundary line with respect to the position of abscissa and ordinate that will change, and this change will cause the motor to run more model (dynamic) close to the actual operating conditions of the motor. 也就是说，即使马达的实际运行效率会随着马达的使用发生改变，通过采用本发明的修正(更新)方法，马达运行模型仍能够(动态地)反映马达的实际运行状况。 That is, even if the actual operating efficiency of the motor will change as the motor is used, by employing the present invention, the correction (updating) method, the motor is still able to run the model (dynamic) reflects the actual operating conditions of the motor. 下面将结合图5Α和图5Β所示的两个实施例对上述的修正(更新)方法进行说明。 Two  and below in conjunction with FIGS. 5Α 5Β shown in the above-described correction (updating) method described embodiments. 3)因计算的修正系数为0.5,故将C'点修正至CC'直线的中点处，即CC'之间距离C 点0JH处。  3) for calculation of the correction coefficient is 0.5, so that the point C 'corrected to CC' of the straight line at the midpoint, 0JH i.e. the distance between the point C CC '. 3)修正系数=(实测效率-理论效率)/10 % = 0.5，故将C'点修正至CC'直线的中点处，即CC '之间距离C点0.5H处。  3) = correction coefficient (measured efficiency - theoretical efficiency) / 0.5 = 10%, so that the point C 'corrected to CC' at the midpoint of a straight line, 0.5H i.e. the distance between the point C CC '. 尽管已参考附图中所示的具体实施例对本发明进行了描述，但是应当理解，在不背离本发明的精神、范围和背景下，本发明所提供的轻量紧固方法可具有许多变化。  Although specific embodiments illustrated in the present invention has been described with reference to the accompanying drawings, it is to be understood that the present invention without departing from the spirit, scope and context, lightweight fastening method of the present invention may be provided with many changes. 上面的描述仅仅是说明性的且不旨在作为本发明的所有可能的实施例、应用或修改的详细清单。 The above description is only illustrative and are not intended as a detailed list of all possible embodiments, applications or modifications of the embodiment of the present invention. 本领域的普通技术人员还将意识到在本发明所公开的实施例中的参数可按不同的方式进行改变，且这些改变均落在本发明和权利要求的精神和范围内。 Those of ordinary skill in the art will also recognize that changes in the parameters of the embodiments disclosed in the present invention may occur in different ways, and all such modifications fall within the spirit and scope of the present invention and the appended claims. 因此，对于本领域的技术人员来说，在不背离本发明的范围和精神的前提下，所描述的方法和系统的各种修改和变化将变得显而易见。 Thus, those skilled in the art, without departing from the scope and spirit of the invention under the premise that various modifications and variations of the described methods and systems will become apparent. 1. 一种用于在运行模型中控制电动马达的运行速度和扭力的方法，其中，所述运行模型包括电动马达的多个运行位置和优化运行区域，每个运行位置对应于电动马达的一个速度参数、一个扭力参数和一个运行效率参数，所述方法包括以下步骤： 检测对应于电动马达在运行模型中的当前运行位置的当前速度参数和当前扭力参数； 输入对应于电动马达在运行模型中的目标运行位置的目标速度参数和目标扭力参数； 确定是否对所述马达的运行状况变化进行优化处理。 A method for controlling the operation of the model speed and torque of the electric motor, wherein the operation model comprises a plurality of operating positions and optimize the operation area of ​​the electric motor, each position corresponding to a running electric motor speed parameter, a parameter and a torque efficiency operating parameters, the method comprising the steps of: detecting a parameter corresponding to a current speed of the electric motor is running the model in the current position and the current running torque parameter; an input operation corresponding to the electric motor model target speed and target parameters operating position parameters of the target torque; determining whether to optimize the operating conditions of the motor change. 2. 根据权利要求1所述的方法，其还包括以下步骤： 根据电动马达的当前速度参数和当前扭力参数确定当前运行位置是否位于所述优化运行区域内；以及如果当前运行位置不是位于所述优化运行区域内： 沿着第一路径调节当前速度参数和当前扭力参数中的至少一个以将当前运行位置移动到中间运行位置，中间运行位置对应于中间速度参数和中间扭力参数并且位于所述优化运行区域内；以及调节中间速度参数和中间扭力参数以沿第二路径将中间运行位置移动到目标运行位置。 The method according to claim 1, further comprising the steps of: determining a current operating position is located within the operating area of ​​the optimization parameter based on the current speed of the electric motor and the torque current parameters; and if the present running position is not located at the optimization of the operating region: adjusting at least a current along a first path to move the currently running operating position to the intermediate position and the current torsion speed parameter parameter, the intermediate operating position corresponding to an intermediate speed and intermediate torque parameters of the optimization parameters and is located within the operating area; and adjusting an intermediate speed and intermediate torque parameters to parameters along the second path to the intermediate position to the target running operating position. 3. 根据权利要求2所述的方法，其还包括以下步骤： 在所述优化运行区域内选择一个优化中间运行位置作为所述中间运行位置。 3. The method according to claim 2, further comprising the steps of: selecting a region within the optimal operation optimization intermediate operating position as the intermediate operating position. 4. 根据权利要求3所述的方法，其中： 所述优化中间运行位置被选择为具有从所述优化运行区域到当前运行位置的最短直线距离的位置。 4. The method according to claim 3, wherein: said intermediate operating position, the optimization is selected to have a position from the optimal operation of the current region to the shortest straight line distance of the operating position. 5. 根据权利要求2所述的方法，其中： 通过改变被施加至电动马达的行驶电压和行驶电流而进行将当前运行位置移动到中间运行位置和将中间运行位置移动到目标运行位置的操作中的至少一个。 The method according to claim 2, wherein: the electric motor is applied to the driving voltage and driving current for the current running position to the intermediate operative position and the intermediate operating position to the operating position of the operation target by changing the at least one. 6. 根据权利要求2所述的方法，还包括以下步骤： 根据在目标运行位置上的计算的效率参数来修正运行模型中的选定位置的效率参数。 6. The method according to claim 2, further comprising the step of: correcting the position of the selected operation efficiency parameter in accordance with the model parameter calculated in the efficiency of operation of the target position. 7. 根据权利要求6所述的方法，其中： 所述根据在目标运行位置上的计算的效率参数来修正运行模型中的选定位置的效率参数的步骤包括： 检测马达在目标运行位置的输入电压和电流； 根据马达在目标运行位置的扭力和转速以及所检测的在目标运行位置的输入电压和电流，计算马达在目标运行位置的实际运行效率； 根据运行模型中的对应于目标运行位置的运行效率以及所计算的马达在目标运行位置的实际运行效率来计算修正系数； 选择与目标运行位置接近的至少一个要被修正的位置； 计算目标运行位置与要被修正的位置之间的距离； 根据所计算的修正系数和所计算的距离来计算修正量； 根据所述修正量修正要被修正的位置在运行模型中的位置。 The method according to claim 6, wherein: said step of efficiency according to the target parameters calculated in the operating position correcting operation efficiency parameter selected location model comprises: detecting an input operation of the motor at the target position voltage and current; the motor torque and speed target operating position and the input voltage and current in the target operating position is detected, calculating the actual motor operating efficiency in the target operating position; operating position according corresponds to the target operating model of and a motor operating efficiency in the calculated actual operating efficiency of the operation target position calculated correction coefficient; selecting the target operating position of the at least close to a corrected position; calculating a distance between the target position and the operating position is to be corrected; the correction coefficient calculated distance and the calculated correction amount is calculated; correction based on the correction amount to be corrected in position to run the model. 8. -种用于在运行模型中控制电动马达的运行速度和扭力的方法，其中，所述运行模型包括电动马达的多个运行位置和优化运行区域，每个运行位置对应于所述电动马达的一个速度参数、一个扭力参数和一个运行效率参数，所述方法包括以下步骤： 检测对应于电动马达在运行模型中的当前运行位置的当前速度参数和当前扭力参数； 输入对应于电动马达在运行模型中的目标运行位置的目标速度参数和目标扭力参数； 确定是否对所述马达的运行状况变化进行优化处理。 8 - The method of controlling the speed and torque of the electric motor in the model species for operation, wherein the operation model comprises a plurality of operating positions and optimize the operation area of ​​the electric motor, each position corresponding to the operation of the electric motor a speed parameter, a parameter and a torque efficiency operating parameters, the method comprising the steps of: detecting a parameter corresponding to a current speed of the electric motor is running the model in the current position and the current running torque parameter; an input operation corresponding to the electric motor target speed and a target torque parameters of the model parameters of the operating position in a target; determining whether to change the motor operating conditions to optimize the process. 9. 根据权利要求8所述的方法，其还包括以下步骤： 根据电动马达的当前速度参数和当前扭力参数确定当前运行位置是否位于所述优化运行区域内； 如果当前运行位置不是位于所述优化运行区域内，确定是在优化运行区域中选择一个中间运行位置还是直接将当前运行位置移动到目标运行位置而无需在所述优化运行区域中选择一个中间运行位置；以及如果需要在优化运行区域中选择所述中间运行位置： 沿着第一路径调节当前速度参数和当前扭力参数中的至少一个以将当前运行位置移动到中间运行位置，所述中间运行位置对应于中间速度参数和中间扭力参数并且位于所述优化运行区域内；以及调节中间速度参数和中间扭力参数以沿第二路径将中间运行位置移动到目标运行位置。 9. 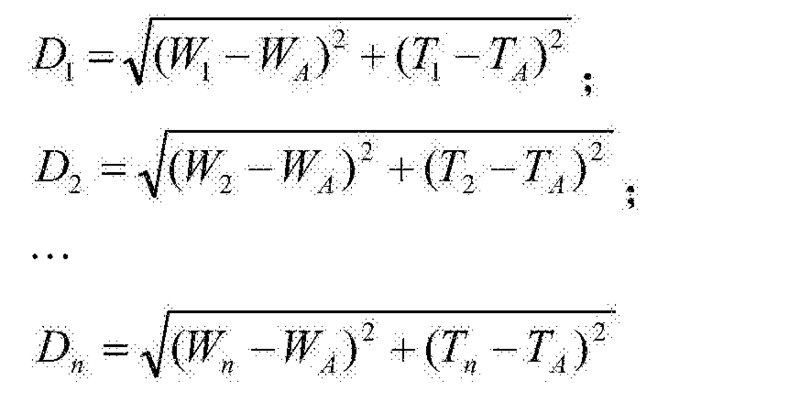 The method according to claim 8, further comprising the steps of: determining a current operating position is located within the operating area of ​​the optimization parameter based on the current speed of the electric motor and the torque current parameters; if the current position is not located in the optimization run within the operating area, is determined in the optimal operation of a selected area or directly to an intermediate operating position moves the current position to the target running operating position without selecting an intermediate operating position of the optimal operation region; and if necessary optimize the operating region selecting said intermediate operating position: adjusting the current along a first path and a current torsion speed parameter parameter of at least one operation to move the current position to the intermediate operative position, the intermediate operating position corresponding to the intermediate speed and intermediate torque parameters and parameters located within the operating area optimization; intermediate speed and adjusting the parameters and the parameters to the intermediate torsion movement along the second path to the intermediate operative position to the target operating position. 10. -种电动车辆马达控制器，包括： 处理器；以及存储装置，其包括被存储在其上的运行模型，所述运行模型包括电动马达的多个运行位置和优化运行区域，每个运行位置对应于所述电动马达的一个速度参数、一个扭力参数和一个运行效率参数;其中，所述处理器被配置成： 检测电动马达的当前速度参数和当前扭力参数； 基于当前速度参数和当前扭力参数确定电动马达在运行模型中的当前运行位置； 确定对应于电动马达在运行模型中的目标运行位置的目标速度参数和目标扭力参数； 计算用于在运行模型中连接当前运行位置和目标运行位置的两个过渡路径的动力要求，两个过渡路径包括由一个矢量所组成的第一路径以及由两个矢量所组成的第二路径； 以及至少部分地基于所计算的动力要求选择两个过渡路径中的一个以控制电动马达。 10. - kind of electric vehicle motor controller comprising: a processor; and a storage means, which includes in its running on the model, the model comprises running a plurality of operating positions and optimize the operation area of ​​the electric motor, every storage operation position corresponds to a speed parameter of the electric motor, a torsion and a parameter operating efficiency parameters; wherein said processor is configured to: detecting the current speed parameters and a current of the electric motor torque parameter; based on the current speed and the torque current parameters determining a current position of the operating parameters of the electric motor during operation model; determining a target speed corresponding to the parameters of the target parameter and the target torque of the electric motor in the operating position during operation model; calculating operation for connecting the current position and the target operation model operating position power demand transitions two paths, two paths comprises a first transition of a vector path and a second path consisting of the two vectors thereof; and at least partially based on the calculated power required to select two transition paths one to control the electric motor. 11. 根据权利要求10所述的控制器，其中所述处理器还被配置成在所述优化运行区域内选择一个优化中间运行位置作为所述第二路径的顶点。 11. The controller of claim 10, wherein the processor is further configured to select an optimized intermediate operating position as the apex of the second path within the optimal operation region. 12. 根据权利要求11所述的控制器，其中： 所述优化中间运行位置被选择为具有从所述优化运行区域到当前运行位置的最短直线距离的位置。 12. The controller according to claim 11, wherein: said intermediate operating position, the optimization is selected to have a position from the optimal operation of the current region to the shortest straight line distance of the operating position. 13. 根据权利要求10所述的控制器，其中根据所述第一或第二路径控制电动马达是通过改变被施加至电动马达的行驶电压和行驶电流中的至少一个而使在过渡到目标运行位置期间内任何时间的当前运行位置位于在运行模型中的所选择的过渡路径上而实现的。 13. The controller according to claim 10, wherein the electric motor control according to the first or second path are applied to the electric motor driving voltage and a driving current in at least the transition to the operation target by changing the It achieved an operating position at any time of the current during the transition position is located in the path of the selected operation model. 14. 根据权利要求10所述的控制器，其中所述处理器还被配置成： 根据在目标运行位置上的计算的效率参数来修正运行模型中的选定位置的效率参数。 14. The controller according to claim 10, wherein the processor is further configured: to correct the position of the selected operating efficiency parameter in accordance with the model parameter calculated in the efficiency of operation of the target position. 15. 根据权利要求14所述的控制器，其中： 所述根据在目标运行位置上的计算的效率参数来修正运行模型中的选定位置的效率参数包括： 检测马达在目标运行位置的输入电压和电流； 根据马达在目标运行位置的扭力和转速以及所检测的在目标运行位置的输入电压和电流，计算马达在目标运行位置的实际运行效率； 根据所述运行模型中的对应于目标运行位置的运行效率以及所计算的马达在目标运行位置的实际运行效率来计算修正系数； 选择与目标运行位置接近的至少一个要被修正的位置； 计算目标运行位置与要被修正的位置之间的距离； 根据所计算的修正系数和所计算的距离来计算修正量； 根据所述修正量修正要被修正的位置在运行模型中的位置。 15. The controller according to claim 14, wherein: said correcting efficiency parameter selected location comprising an operation efficiency of the model parameter calculated in the target operating position of: detecting an input voltage of the motor at the target operating position and current; the target motor torque and speed operating position and the input voltage and current at the operating position of the target detected, calculates the actual operating efficiency of the motor at the target operating position; according to the operation model operating position corresponding to the target the operating efficiency of the motor and the calculated actual operating efficiency in the target operating position to calculate the correction coefficient; calculating a distance between an operating position and a target position is to be corrected; selecting the target operating position of the at least close to a corrected position ; calculated correction amount based on the correction coefficient and the calculated distance calculated; position during operation model correction based on the correction amount to be corrected position. 16. -种电动车辆，包括： 电动驱动马达； 电池，所述电池被配置成为电动驱动马达供电；以及电动车辆马达控制器，包括处理器以及在其中存储有运行模型的存储器，运行模型包括电动马达的优化运行区域，且处理器被配置成： 检测电动驱动马达的当前速度参数和当前扭力参数； 基于当前速度参数和当前扭力参数确定电动驱动马达在运行模型中的当前运行位置； 确定对应于电动马达在运行模型中的目标运行位置的目标速度参数和目标扭力参数； 确定是否对所述马达的运行状况变化进行优化处理。 16. - kind of electric vehicle, comprising: an electric drive motor; a battery-powered electric drive motor is configured; and an electric vehicle motor controller comprising a processor and a memory storing therein operation model, running the model includes an electric optimization of the operating region of the motor, and the processor is configured to: detecting the electric current of the drive motor speed parameter and a current torque parameter; parameter based on the current speed and the torque current parameter to determine the current location of the electric drive motor running operation model; determining corresponding target speed and a target torque parameters parameter target operating position of the electric motor during operation model; determining whether to change the motor operating conditions to optimize the process. 17. 根据权利要求16所述的车辆，其中所述处理器还被配置成： 确定当前运行位置是否位于所述优化运行区域内； 如果当前运行位置不是位于所述优化运行区域内，确定是在所述优化运行区域中选择中间运行位置还是直接将当前运行位置移动到目标运行位置而无需在所述优化运行区域中选择中间运行位置；以及发送被配置成使电动驱动马达在运行模型上从当前运行位置转换至目标运行位置的控制信号。 17. The vehicle according to claim 16, wherein the processor is further configured to: determine a current operating position is located within the operating area of ​​the optimization; if the current optimization of the operating position is not located within the operating area, is determined the optimal operation of the intermediate region in the operating position select or directly moves the current position to the target operation without selecting an intermediate operating position in the operating position the optimal operation region; and configured to transmit the electric drive motor is running from the current model converting the control signal to the operating position, a target operating position. 18. 根据权利要求17所述的车辆，其中所述处理器还被配置成： 如果需要在所述优化运行区域中选择中间运行位置： 沿着第一路径调节当前速度参数和当前扭力参数中的至少一个以将当前运行位置移动到中间运行位置，所述中间运行位置对应于中间速度参数和中间扭力参数并且位于所述优化运行区域内；以及调节中间速度参数和中间扭力参数以沿第二路径将中间运行位置移动到目标运行位置。 18. A vehicle according to claim 17, wherein the processor is further configured to: if desired an intermediate operating position select the optimized operation region: adjusting the speed parameters and current parameters of the current torque along a first path moving at least one of the currently running operating position to the intermediate position, the intermediate operating position corresponding to the intermediate speed and intermediate torque parameters of the optimization parameters and is located within the operating area; and adjusting parameters and intermediate torsion intermediate speed along a second path parameter run the intermediate position to the target operating position. 19. 根据权利要求18所述的车辆，其中所述处理器还被配置成： 在所述优化运行区域内选择一个优化中间运行位置作为所述中间运行位置，其中所述优化中间运行位置被选择为具有从所述优化运行区域到当前运行位置的最短直线距离的位置。 19. A vehicle according to claim 18, wherein the processor is further configured to: select an optimized intermediate operating position, as the intermediate operating position within the optimal operation region, wherein said intermediate operating position is selected to optimize having a position from the optimal operation of the current region to the shortest straight line distance of the operating position. 20. 根据权利要求17所述的车辆，其中所述控制信号被配置成使电动驱动马达在运行模型上从当前运行位置转换至所述目标运行位置，这是通过改变被施加至所述电动马达的行驶电压和行驶电流中的至少一个而使在转换期间内任何时间的当前运行位置位于在运行模型中的所选择的转换路径上而实现的。 20. A vehicle according to claim 17, wherein said control signal is configured to drive the electric motor is switched from the current position to the operating position on the operation target operating model, which is applied to the electric motor by varying the driving voltage and the driving current in at least one of the conversion achieved in the conversion path of the current operating position at any time during operation is located in the selected model. 21. 根据权利要求16所述的车辆，其中所述处理器还被配置成： 根据在目标运行位置上的计算的效率参数来修正运行模型中的选定位置的效率参数。 21. A vehicle according to claim 16, wherein the processor is further configured: to correct the position of the selected operating efficiency parameter in accordance with the model parameter calculated in the efficiency of operation of the target position. 22. 根据权利要求21所述的车辆，其中： 所述根据在目标运行位置上的计算的效率参数来修正运行模型中的选定位置的效率参数的步骤包括： 检测马达在目标运行位置的输入电压和电流； 根据马达在目标运行位置的扭力和转速以及所检测的在目标运行位置的输入电压和电流，计算马达在目标运行位置的实际运行效率； 根据运行模型中的对应于目标运行位置的运行效率以及所计算的马达在目标运行位置的实际运行效率来计算修正系数； 选择与目标运行位置接近的至少一个要被修正的位置； 计算目标运行位置与要被修正的位置之间的距离； 根据所计算的修正系数和所计算的距离来计算修正量； 根据所述修正量修正要被修正的位置在运行模型中的位置。 22. The vehicle according to claim 21, wherein: said step of efficiency according to the target parameters calculated in the operating position correcting operation efficiency parameter selected location model comprises: detecting an input operation of the motor at the target position voltage and current; the motor torque and speed target operating position and the input voltage and current in the target operating position is detected, calculating the actual motor operating efficiency in the target operating position; operating position according corresponds to the target operating model of and a motor operating efficiency in the calculated actual operating efficiency of the operation target position calculated correction coefficient; selecting the target operating position of the at least close to a corrected position; calculating a distance between the target position and the operating position is to be corrected; the correction coefficient calculated distance and the calculated correction amount is calculated; correction based on the correction amount to be corrected in position to run the model. 23. -种用于在运行模型中控制电动马达的运行速度和扭力的方法，包括权利要求1至7中的任意一个技术特征或者技术特征的任意组合。 23. - The method of controlling any combination of speed and torque of the electric motor during operation model species, comprising any one of the technical features or technical features of the claims 1 to 7. 24. -种用于在运行模型中控制电动马达的运行速度和扭力的方法，包括权利要求8至9中的任意一个技术特征或者技术特征的任意组合。 24. - The method of controlling any combination of speed and torque of the electric motor during operation model species, comprising any technical feature or features of claim 8 to claim 9. 25. -种电动车辆马达控制器，包括权利要求10至15中的任意一个技术特征或者技术特征的任意组合。 25. - kind of electric vehicle motor controller, includes any technical feature or features of claim 10 to claim 15 in any combination thereof. 26. -种电动车辆，包括权利要求16至22中的任意一个技术特征或者技术特征的任意组合。 26. - kind of electric vehicle, including the claims, any combination of any feature or features of a technique of 16 to 22.